Last week I shared some of my favorite online shopping sites, because it's fun to pass along good stuff when I find it. I've also tried Stitch Fix, although I haven't kept many of their pieces because I don't like to pay retail for my wardrobe. I have read mixed reviews about Le Tote, so I felt it was my blogging duty to give it a try and report back. Le Tote is kind of like borrowing clothing from your fashionable friend's closet. For $49 a month, this company sends you a box containing three clothing and two accessory items. During sign up, you give them your sizing information, and browse their extensive collection to choose things for your "closet". New items are added weekly. Once you receive your items, you are free to wear them for as long as you'd like. If you really love something, it's available for purchase. Pack up the things you don't want in the postage paid envelope (they even launder them for you), and as soon as Le Tote receives them back, they send out a new box. You can receive unlimited boxes each month, although with shipping back and forth, the max you could probably do is three to four boxes. I signed up and ordered my first box on Wednesday, and had it by Saturday. I received three tops, a necklace, and a pair of earrings. Only one top didn't fit well, and I enjoyed wearing the other items. 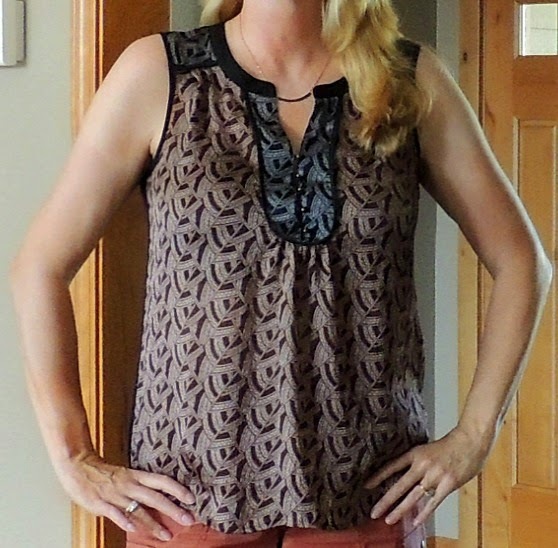 This Daniel Rainn blouse was especially cute, and really comfortable. It was fun to receive a box of clothes that I could wear and then return. I decided not to purchase anything from this box, but if I had, their prices are very reasonable. I'll probably try it for a few months and then decide whether or not to continue. Has anyone else tried Le Tote? That's an interesting business concept and one I'm seeing a lot lately. Makes sense. It's definitely an interesting concept - kind of mixing online sales with thrift stores. Wow - I've just learned something more from you Lana! I never heard of a company letting you wear clothes and then return them! The top is very cute on you!! Thanks Susan. I'm going to try it for a month and see if it's worth the money. Thanks for the review! It's interesting reading people's experiences with Le Tote and Stitch Fix.I bet it's fun to have a constant rotation of 'new' things every few weeks! I am thinking about trying Golden Tote later this month or next. Golden Tote is another one I want to try. Might give up Stitch Fix and do that one. The first box was a lot of fun - you should give it a try! What a great concept! Your top is so pretty! Thanks Jill. I really liked the top too! That is one beautiful top - hope you kept it. Love the color of your shorts too. Together they are perfect! Thanks Ada. I did keep this one! Great blouse! I hadn't heard of The Tote but I will check them out. Thanks for sharing with Visible Monday! Thank you so much for hosting. It's one of my favorite fashion link ups!